I’m looking out the window of our cozy little house, thinking about the last two weeks. Neither Sue nor I had ever been to the Grand Canyon, Zion, or Bryce so we were excited to get out of town. We drove to Boise first to stay a night with my niece Pam. She is in her second year of residency as a GP, but she’s also one of my climbing partners. She was able to get a half day off and we climbed at the Black Canyon just outside of Boise. It is a cheesy little cliff similar to Vantage but the climbing was real, and we both got a little gripped. 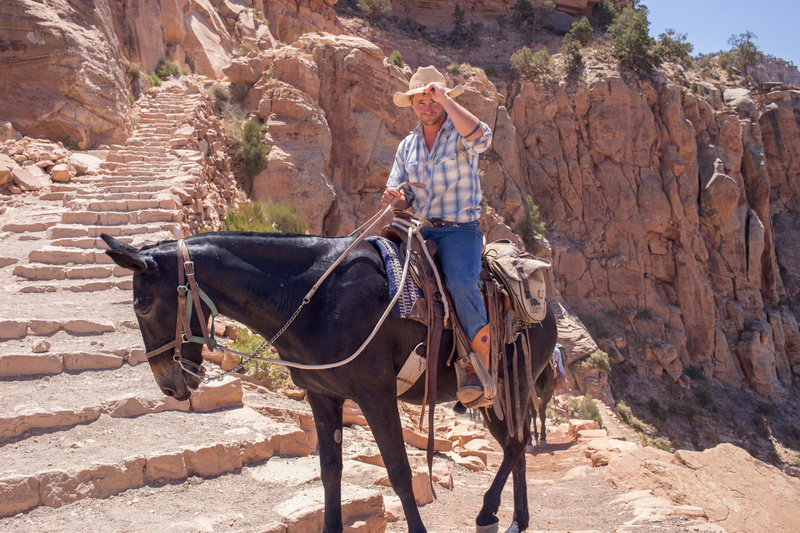 The drive down to Zion was not fun at all…simply something you have to grin and bare. I love to listen to free talking books from the library while I put the miles behind me. We pulled into our first of several free campspots thanks to this cool website. I don’t have any classes this summer, or income, so avoiding unnecessary expenses is a priority. I’m thinking I may apply for unemployment…heck I might even find a job. I have no desire to have the summer off, though the weather is good for painting. We had to get on a shuttle to get in to Zion. Cars are not allowed in peak season. It’s $20 a person to walk into Zion from the shuttle. We were thankful to have our $10 lifetime senior passes. After a 60 minute wait we got on a shuttle and then got off at the first pretty viewpoint. 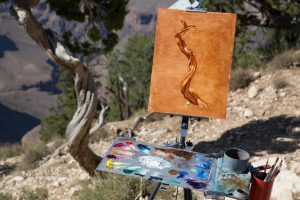 I hiked off trail up to a quiet spot and started the first of many bad paintings this trip. 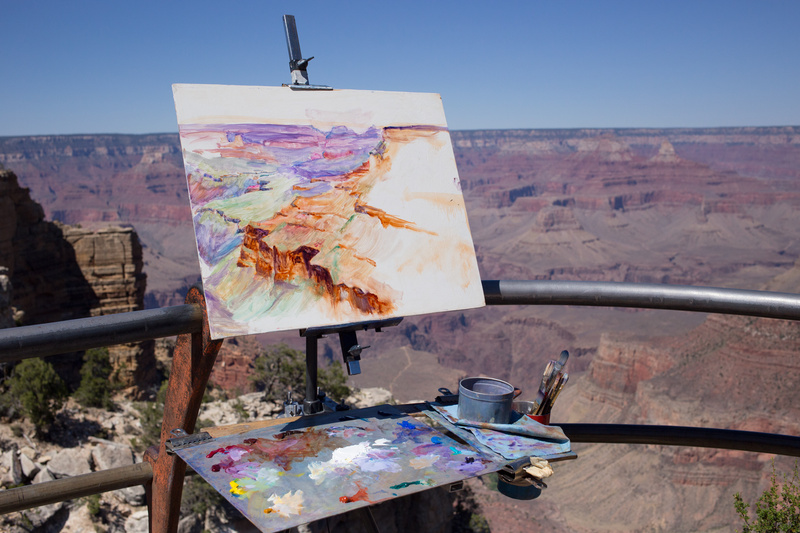 It was simply too hot to stand in the sun and paint…not too mention the jet-lag from the long drive. My new oil based gesso grounds allows me to easily wipe back down to clear white “canvas” (board). 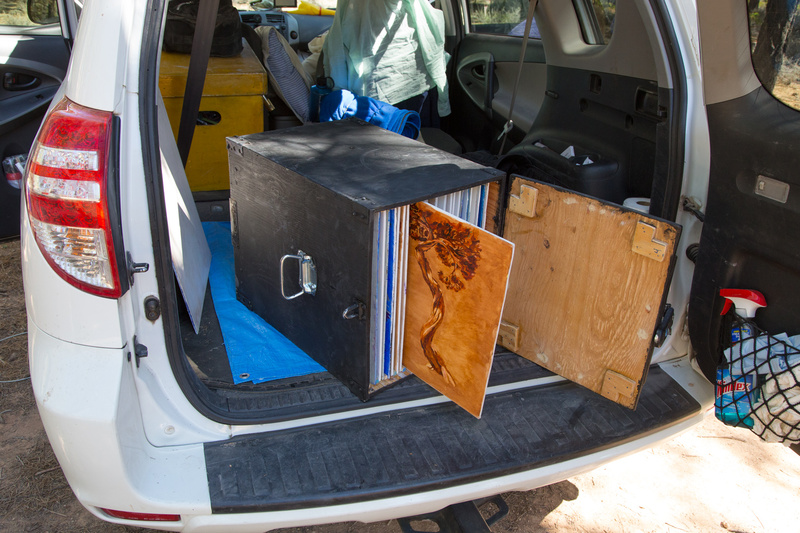 I packed up, found Sue and hit the road for the Grand Canyon…glad to put over hot, over crowded Zion in the rear window. 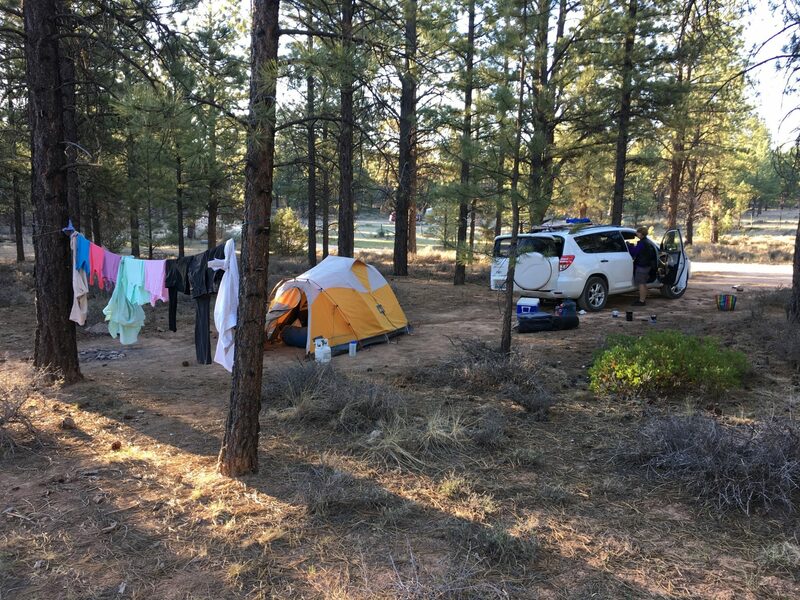 We pulled into our free Grand Canyon campsite at 4AM dead tired. In the morning we drove into the park and man was it confusing. 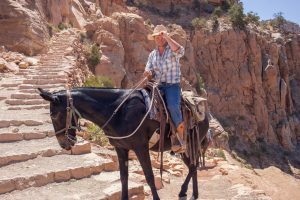 There are looping roads circling everywhere when you get close to the South rim by Grand Canyon village. They gave us a map but it was so confusing I had to use my phones GPS to get anywhere. We stumbled on free parking near one of the trails and used that for the next week. I did another bad painting out over the canyon that morning: Rim Trail, pictured above. I had a young guy from Kansas tell me I was the best artist he’d ever seen. Clearly they don’t have many painters in Kansas. It looked ok after the first morning and I should have left it alone. But alas, I worked on it a second day and ruined it. And there went another painting wiped down to white. My track record was not looking good so we decided to combine a hike with the painting. Oxygen often makes me paint better. 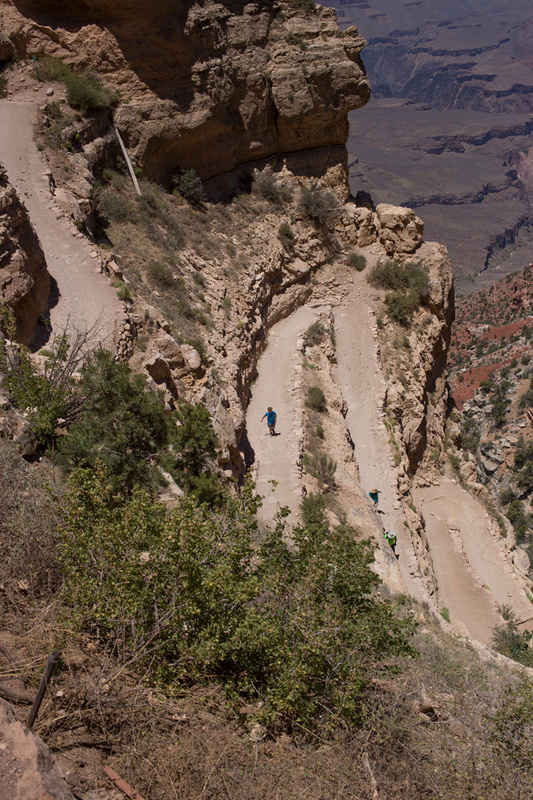 We did a dawn start and joined the hoards hiking down the Bright Angel trail. Two miles down I found a wide spot in the switchbacks where I could set up and be clear of the stream of hikers and tourists on mule trains. Tourists pay $800 for a two night round trip ride on a mule down the canyon. I guess if you are rich it might be worth it. My daughter did the 16 mile hike on foot in a day a few years ago, but that was in the Spring, not early July. I was tempted to try the hike myself, but Sue wasn’t buying it. We would have had to bivy, and hike back up at night to avoid the heat. 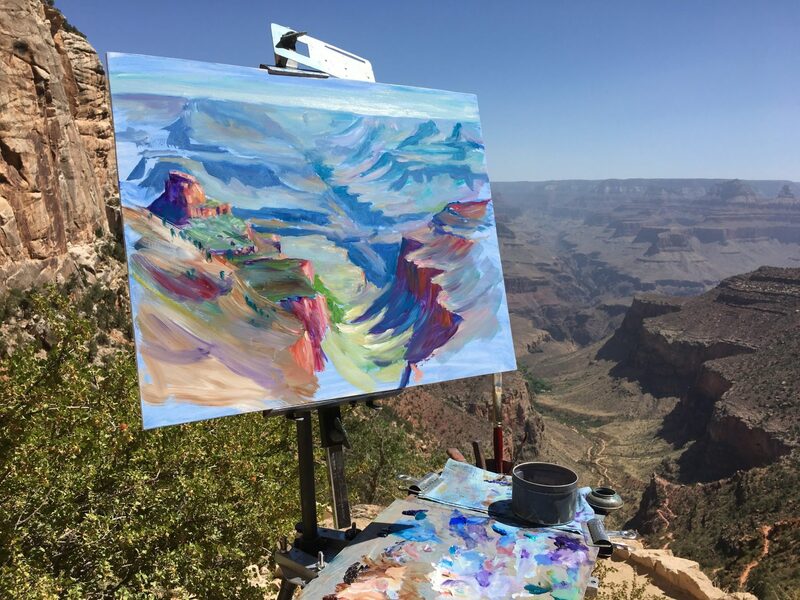 The painting I did on the Bright Angel trail is rough, but it has potential for refinement in the studio. It was fun to feel it start to breath on it’s own. Lots of people liked it, commenting on it’s beauty, and that is usually a good sign. Those tourists are not dumb. I got into a routine where I would do morning and afternoon paintings. After about 3 days of that, where the morning painting would go well, and the afternoon painting would turn into a ‘wipe off’, I realized I could do one or the other, but not both. It was simply too hot to work all day in the blazing sun. Temperatures ranged from 90 to over 100. The evening light was supremely pretty out across the canyon, but after 4 failures I realized I could not paint it. I could draw the shapes, but I couldn’t figure out the color of the grass. Anything that isn’t vertical in the Grand Canyon is covered in grass. It looks like a hillside in Eastern Washington. It’s a boring yellow green that fades to gray in the distance, and turns slightly blue depending on the time of day. The shadows of the red cliffs were also troubling, and don’t even get me started on tree covered slopes of grass. My trees look like pasted on cucumbers. I had some moderate success on the South Kaibab Trail, which we hiked down for a mile, loosing 1000 feet of elevation. The viewpoint where I stood was a 4th class ledge, and I wished I’d brought some cams with which to anchor myself. 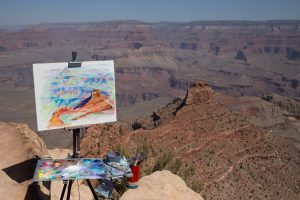 This didn’t stop the crazy instagram tourists from jumping up and down on the edge of the 300 foot cliff next to my easel. “Do it again, and try to click your heels together!” And they wonder why I wear headphones. Our last hike was the Deception Trail. 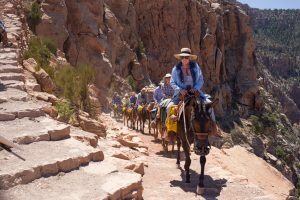 It is an unmaintained trail, which means it’s too hard and dangerous for mules. They can’t make money on the trail, so they abandon it. People can pick their way down it, if you don’t mind crumbling wooden bridges over 70 foot drops. I don’t have a picture of that painting yet. I had switched over to monotone painting by then. The impossibly hard color of the canyon had simply wore me down. I figured I’d get the values right, and figure out color at home from my imagination. On a rest day we saw some paintings for sale by Serena Supplee which gave me some great ideas. 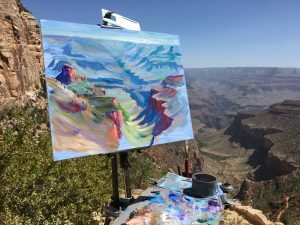 After our rest day following our 3 canyon hikes I finally took the bus all the way out to Hermit’s Rest (8 miles) and set up to paint the afternoon light. As I was framing my view in my little aluminum viewfinder I noticed a really cool twisted tree that looked more fun than the canyon. The reason trees were even on my radar was that Sue had started sketching too, and she had been working on trees. I decided that it was a good candidate for a monotone and set to work. I do these by rubbing the board down with Transparent Oxide Brown and Genuine Rectified Turpentine. This gives the ‘canvas’ a lovely brown tone that is quite malleable. Then I lift out the highlights with a brush wetted with Gamsol (Odorless Mineral Spirits). I push and pull cool and warm colors by using Transparent Oxide Brown and Red. Richard Schmid calls them TOB and TOR. For the darkest colors I used just a touch of Cobalt or Ultramarine Blue. Something clicked that day with the twisted pine tree. I have no idea why, but suddenly I was able to see, and paint exactly what I saw. I actually turned to Sue who was napping nearby and said: “Who is this guy, and what has he done with Mark?” I don’t think I’ve ever painted that well in my entire life. Sadly, I came back the next day to work on it again in the same light and may have ruined it. I have yet to take it out of the wet painting carrier box since adding the upper branches and leaves. After 10 days we’d had enough of the heat and headed North. We were thinking the North Rim, but halfway there I got tired of driving and saw a sign that read: “30 miles to Bryce Canyon”. We found a great free camping spot right outside the entrance and crashed at dawn. After a few hours of sleep we drove to Bryce Point and hiked down a mile to a nice view where I did a another monotone. I thought I’d be too tired to paint but once again something clicked. A lot of hikers liked it, so it might be good. I did another one the next day, but it wasn’t as successful. 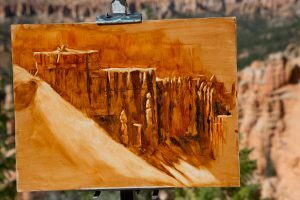 I swear the shadows on those hoodoo towers move as fast as breaking waves at the ocean. Hiking up to the rim at Bryce’s Sunset Point I finally hit the wall, spent, exhausted and done. My 45 pound pack felt like it weighed 200 pounds. I may have under hydrated. I had plenty of water, but forgot to drink it. Once we got to the car I had to nap all afternoon and went to bed without dinner. I think it was a touch of heat exhaustion. Whenever I was painting Sue would sit in the shade…while I baked in the 100 degree sunshine at my easel. She has always been the smarter hiker in the family. We left after that and drove north to the City of Rocks for some climbing. On the second day Pam joined us, she had the 4th off and the City is only 3 hours from Boise. Sue tries to take it easy climbing, but with Pam there we could hit the hard stuff. We did Wheat Thin, Columbia Crack, Intruding Dyke and Mystery Achievement at the Breadloaves. Sue was burned out on living for 16 days out of a little mountaineering tent and talked me into driving home. I was just getting warmed up at climbing and didn’t want to leave, however, the tent zipper was blown, bugs were getting inside, and I have 8 plein air paintings waiting for some TLC. Climbing feels like playing hooky when I’m actually trying to get serious about learning to paint.